Beyond Meat had me with their vegan and gluten free chicken strips from the very start. I remember first spying those products in my local Whole Foods and immediately latching on to all three varieties and tossing them in the freezer. Since then, they have not only improved on the vegan not-chicken strips…but they have since added to their non-meat repertoire. Beyond Meat has introduced vegan chicken poppers, vegan chicken tenders, beyond beef crumbles, beyond beef meatballs, and beast burgers and beastly sliders. I have yet to find the poppers and tenders and meatballs anywhere in my area, but I have stumbled across the two varieties of Beyond Beef Crumbles and…more recently…discovered the Beyond Meat Beast Burger and Beyond Meat Beastly Sliders. Now, it’s not every day I stumble across a vegan/vegetarian slider that I can eat. In fact, the only other sliders I’ve seen are made by Gardein, but they aren’t gluten-free. So…the instant I spotted these at my Whole Foods, I knew there was no escaping the tight budget. I’d squeeze it in and give them a try. Due to my fresh produce and my lack of any sort of gluten-free slider buns…I ignored these in my freezer for a little while. But after hobbling through The Boston Marathon, and not having a produce bin delivered on time…this past weekend, I needed to do something for dinner. I searched my freezer, and have a few options remaining in there. The one that caught my attention was the Beyond Meat Beastly Sliders. Well…why not? I was going grocery shopping that morning, so I could pick up some Udi’s Gluten Free Whole Grain Dinner Rolls to use as slider buns…I figured. In my head, that was the plan. I think I forgot that the Udi’s Gluten Free Dinner Rolls were a little longer than a standard roll…so when I had everything out to start cooking…I realized I was going to have to slice the dinner rolls in half and then slice them open to make a close proximity of a slider bun. Dear Gluten Free bread makers….slider buns…create them. I will buy them. For reals! So while my dinner rolls/slider buns of sorts were toasting in the oven, I got out a saute pan and gave it a splash of olive oil, allowing it to heat up on medium-high heat. Then, into the pan all six of the slider patties went. I was impressed upon opening the package of Beyond Meat Beastly Sliders. The sliders have the appearance of real burgers. 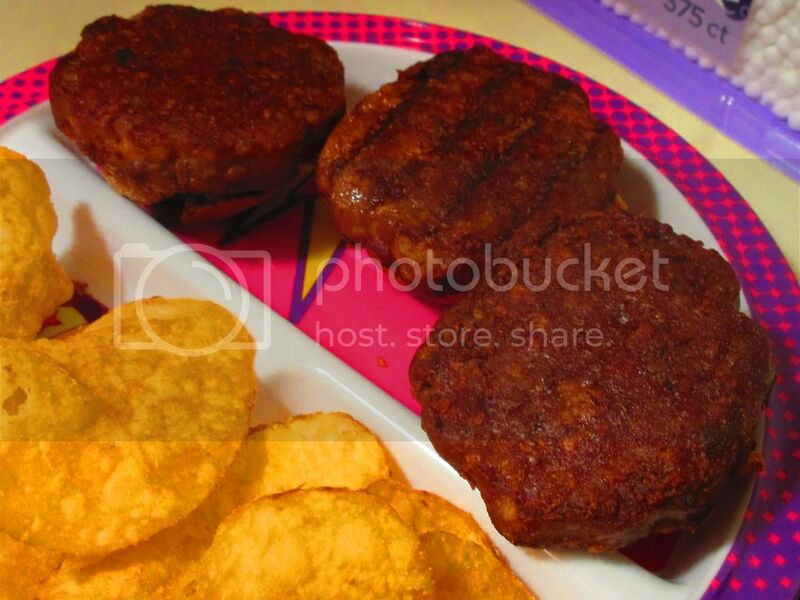 So, it’s not a vegetarian patty that looks nothing like a burger masquerading as a burger. These actually look like burgers. I was impressed. They were so easy to cook up too. Simply add the sliders to a touch of oil in a skillet and cook until lightly brown on both sides. It takes about 5-7 minutes. Then…it’s time to eat. The dinner rolls weren’t a perfect fit for these hearty slider patties, but they worked. So, that’s what matters. I sliced each roll down to “slider” size and then loaded on the burger with a hit of ketchup and…BAM…vegetarian sliders for dinner. It was really that easy. I served these with a side of Zapp’s Voodoo Chips, which if you haven’t tried those…DO IT! I haven’t eaten any sort of meat in over four years. That being said, back when I was big into burgers…you know…Hard Rock Café knew my burger order…these rank right up there with the real thing. Seriously. They have this great meaty texture…and they were hearty and held up. So often, vegetarian and vegan burger substitutes crumble and fall apart. This is especially true with vegan/vegetarian patties that are also gluten-free. It’s one of my pet peeves. This did not happen with the Beyond Meat Beastly Sliders. My roommate had just had sliders on our way to Boston a week before, and she said these were better than the real thing. WOW! I won’t lie…the texture, the flavor…it was awesome. They were juicy and filling. Oh yeah…they are Beastly Sliders for a reason…I was full from my serving of 3 of them. I loved the smokey flavor that these patties had, sort of lending it to the “I taste like beef, but I’m not” flavor. I’m sort of in love with these. It is just eerie how much these resembled real beef patties in appearance and in taste. It sort of freaked me out. In a good way. These will definitely find their way back into my freezer. I might have to experiment with making my own slider buns, but these were truly fantastic. I was beyond impressed. Beyond Meat set out to replicate the taste and texture of beef burgers and to prove that there is a better, more sustainable, plant-based way to satisfy any burger craving. In addition, they prove that there is a healthier, plant-based, sustainable way to make a burger without the need to kill animals. We just needed a better burger…and these sliders are definitely proof that vegan burgers can run with the real thing. Let’s discuss ingredients in the Beyond Meat Beastly Sliders, shall we? These sliders are made from water, pea protein isolate, essential fatty acid oil blend (DHA algal oil, flaxseed oil, sunflower oil, canola oil, and palm oil), methycellulose, carrageenan, calcium sulfate, yeast extract, maltodextrin, potassium bicarbonate, potassium chloride, tapioca starch, caramel color, sorbitol, beyond nutrient blend (vegetable nutrient extract blend (spinach, broccoli, carrot, tomato, beet, shiitake mushroom), sea buckthorn juice powder, beet juice powder, hydrilla powder, horsetail herb powder, moringa leaf powder, mesquite powder, fulvic minerals, pomegranate seed powder), natural flavoring, spices, salt, l-cysteine hydrochloride, onion powder, sugar, onion extract, paprika extract and garlic extract. Lots of stuff I don’t recognize. I admit. And a lot of ingredients at that. I know. But…WOW. 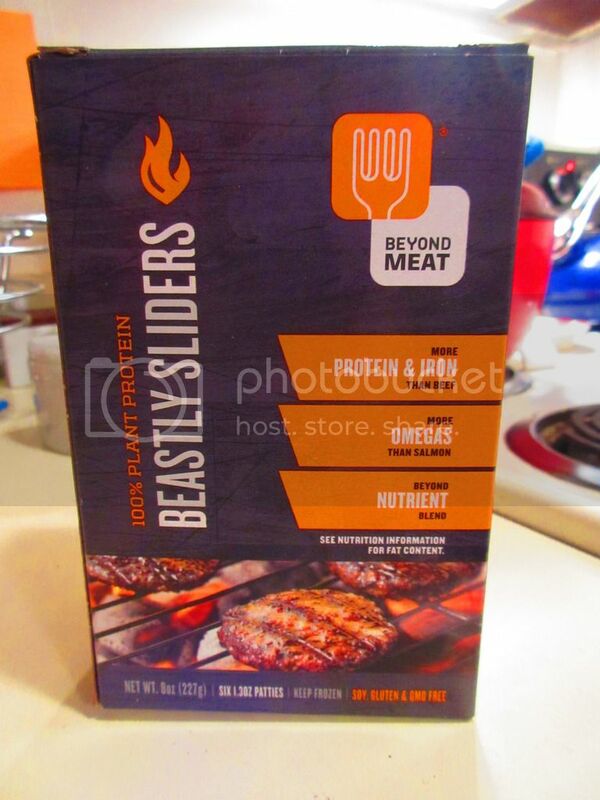 The Beyond Meat Beastly Sliders are gluten-free, soy-free, cholesterol-free, and non-GMO. They are also contain antioxidants, iron, calcium, vitamins B6, B12, D, potassium, as well as DHA and ALA omega-3’s. So, let’s talk the nutritional value for a moment, yes? A serving of the Beyond Meat Beastly Sliders is 3 sliders. You get 6 in a box. This serving of three patties will provide you with 260 calories, 16 grams of fat, 480 mg sodium, 720 mg potassium, 7 grams carbohydrates, 0 grams sugars (YAY! ), 4 grams of fiber, and 23 (YES…23) grams of protein. No wonder you feel full after eating these. WOW! While I don’t make faux meat products a standard in my home, it is fun to try out products every now and again. The past four years I’ve had many vegetarian/vegan burger patties. In the past three years, I’ve consumed quite a few brands that are also gluten-free. By a long shot, Beyond Meat has provided the best burger patty to date. To think…plant power all the way. Totally in love with the nutritional aspect, the flavor, the taste…everything. Now when I want sliders…I can have sliders. So much love. This entry was posted in Bread, Burger, Chips, Entree, Food, Frozen, Gluten-Free, Products, Review, Vegan, Vegetarian, Veggie Burgers by The Celiathlete. Bookmark the permalink.